Do you have a young Star Wars fan in your group? Then give them the chance to fight the Dark Side in a live action Disneyland Jedi training show. 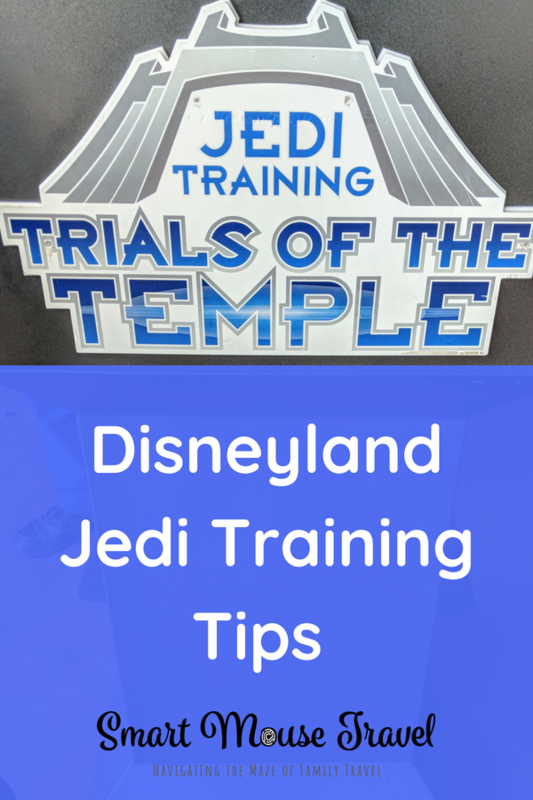 Learn all about this popular experience including what it is, how to register, and what to expect at Disneyland Jedi Training: Trials of the Temple. 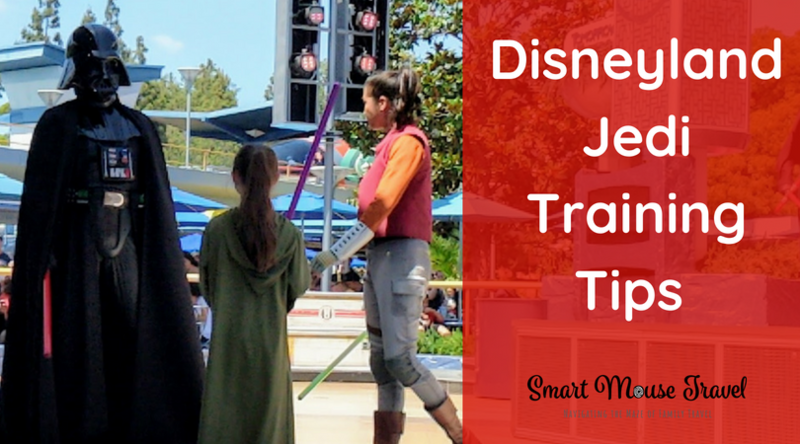 What Is Disneyland Jedi Training? Jedi Training: Trials of the Temple is a live action show. The show takes place at Disneyland Park several times each day. Young Padawans are taught basic lightsaber techniques and the ways of the Jedi. Once their training is complete, these Padawans must face their fears. Each Padawan faces off against the Dark Side during a trial at a hidden, ancient Jedi Temple. 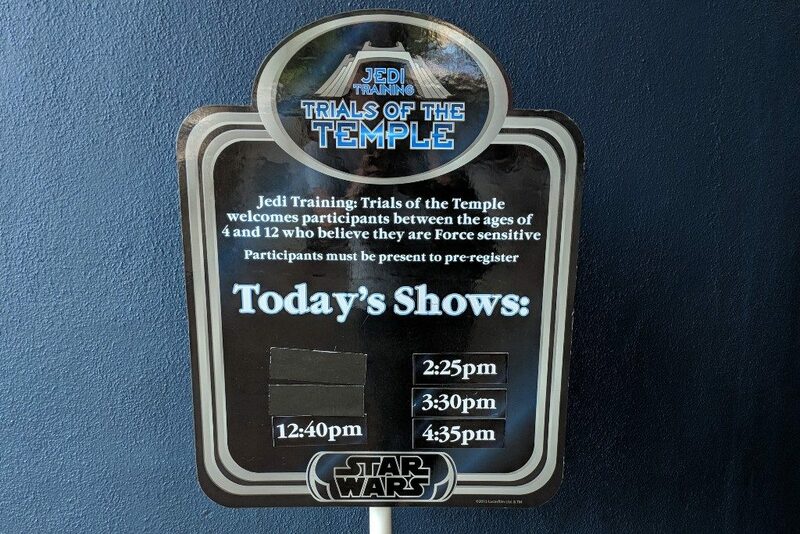 Disneyland Jedi Training: Trials of the Temple is an extremely popular event with limited space each day. Cast members suggest signing up within the first hour of Disneyland Park opening. Signing up at park opening gives the best odds of securing a spot in the show. If you really want to have your child participate in Disneyland Jedi Training but do not arrive right at park opening, I still suggest trying to register. Our first day we arrived about 90 minutes after park opening and no spots were available. A different day during the same trip we arrived closer to two hours after park opening. I was doubtful there would be an opening, but there were still several spots available. To sign up for Disneyland Jedi Training go to the exit area of Star Wars Launch Bay. Then check the signs for what shows, if any, still have room for participants. A cast member will ask your child a few questions to gauge if s/he is able to follow the basic instructions necessary to participate in the show. If your child seems ready, they will be officially registered for a specific showtime of Jedi Training. The cast member will give you a printed return ticket with that showtime. Take good care of this ticket, because that paper is the only way your child will be able to return and participate in the show. Even if all the available spots have been taken for the day, there is still a chance your child can participate. Ask cast members about being an alternate Padawan. 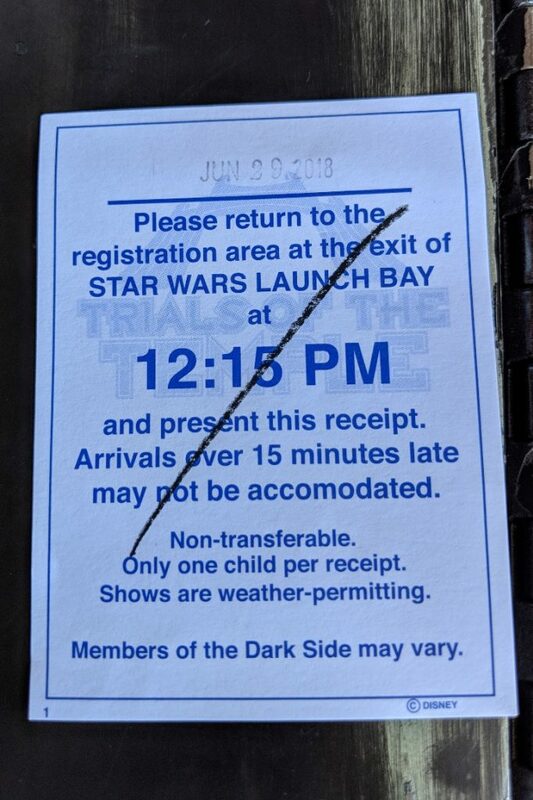 Sometimes alternates can participate if an officially registered child does not return to the Disneyland Jedi Training: Trials of the Temple show. Your child should arrive back at the registration area 30 minutes prior to the scheduled showtime. When you arrive, the cast member will collect the registration ticket and ask if your child needs to use the restroom. It is a good idea to have a bathroom break right before drop-off, since there is no opportunity to use the facilities until after the show is completed. This is about an hour total from drop-off until the end of the show. 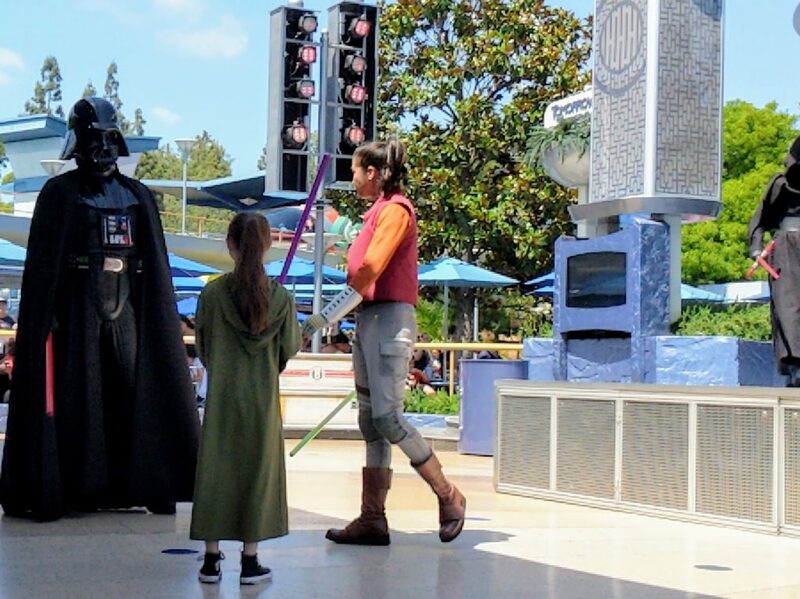 A cast member will then direct the child into an area with more cast members who provide them their Jedi robe. Parents can remain in a close but separate area until a few minutes before scheduled showtime. When showtime is near, the cast members encourage parents to go to the reserved family viewing area near the stage. There are several staff that will make sure the children stay with the group from the holding area to the stage. You are also welcome to stay near the holding area and follow behind the kids if you are uncomfortable leaving them. The Jedi Training show is a lot of fun. The young Padawans are searching for an ancient Jedi temple. This temple is where they must face trials to further their training. Using the Force they are able to reveal the Jedi temple and are then tested by the Dark Side. During Elizabeth’s performance the Padawans had to fight either Kylo Ren or Darth Vader, but exact members of the Dark Side may vary. The Padawans do several activities together with the guidance of their Jedi Master. Each Padawan also has an individual lightsaber duel with a member of the Dark Side. Spoiler alert: The Jedi and Padawans always successfully complete their trials. After the trial is complete, your child will be dismissed to you at the reserved family viewing area. 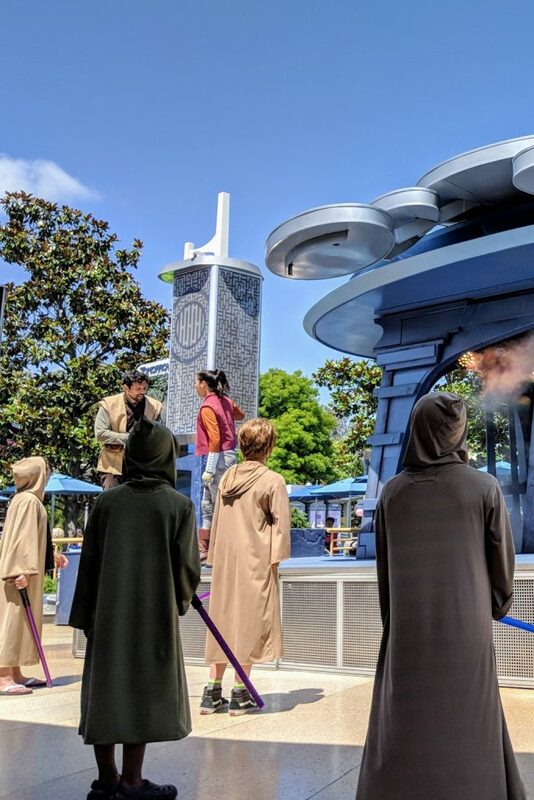 Disneyland Jedi Training: Trials of the Temple is a great activity for your young Star Wars fan. It is a rare opportunity for them to face off against the Dark Side like a real Jedi. Jedi Training: Trails of the Temple is an entertaining show to watch even if your Padawan doesn’t meet the participation requirements or is a little afraid to fight the Dark Side. Remember to sign up as early as possible to secure a spot and hold on to your registration ticket. 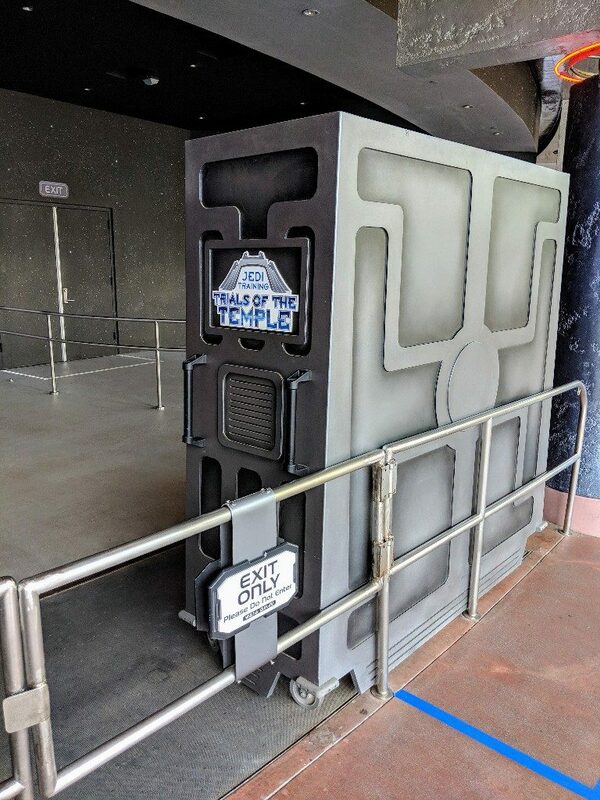 Star Wars Launch Bay is also right there with lots of great props and character meet-and-greet opportunities, so make sure to check it out too. Need more help planning a Disneyland vacation? I can help!